This September – and how appropriate is that – Rhino brings us a wealth of Big Star related reissues and unreleased material. On the 15th comes Keep An Eye on the Sky, a 4-CD boxset that combines Big Star album tracks, alternate takes, demos and live material, and on the 28th, a 2-CD deluxe edition of Chris Bell’s I Am the Cosmos. 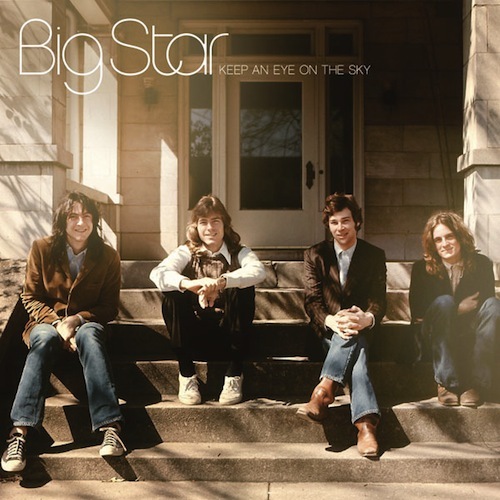 Big Star founding member and drummer, Jody Stephens, talked with AD over the phone from Ardent Studios in Memphis, Tennessee, about the upcoming box set, being a member of a cult band, why Ardent Studios has been home for so long and whether the band is working for the CD or the other way around. Aquarium Drunkard: I’ll get my fanboy moment out of the way up front and just say how much I love Big Star. AD: Well, I guess it’s been a minute since a lot of those photos were taken. JS: Yeah, and it makes such a great impression, I almost step out of body and go, “damn, I wish I was part of that,” you know? AD: What I’ve seen of the box set looks like it’s a pretty exhaustive and well-done package. JS: They spent a lot of time and care and thought. Those guys, as did John Fry [Ardent Studio founder and owner] and Adam Hill, who was kind of the research archivist, if you want to give it an official name. Basically what he did was look through all the files and photos and the tape vault we have upstairs [at Ardent] and make phone calls to David Bell and Andy [Hummell; Big Star bassist] and anyone we thought might have Big Star recordings, but it’s pretty much all here. AD: I was going to ask how much work you did or how much input you had on the content of the set. JS: Very little. I’ve got to admit to you, I had a look at the liner notes and that sort of thing, but very little in shaping and directing it. I have a lot of faith and trust in John Fry and the folks at Rhino, because I’ve known at least one of them for awhile. Everyone seems to have the project’s best interest at heart. And it’s not like you can steer this package into a Top 40 commercial venture. It really is more about the musical personalities of the people involved. Because we had no hits, you know? [laughs] So it really is more about the story than it is about any kind of commercial leanings and wringing all the sales out of this thing that you can. At the end of the day, you either need to be a fan of the band or turned onto this project by a fan of the band. That’s kind of the history of the band anyway; one person told another. And over a period of 20 years, that’s grown to be a number of people. We are far from being a household name. We’re still in that cult status. AD: Undoubtedly, when you set out as a musician, you have a certain goal of some level of success. At what point did you become comfortable with the band’s role as a cult band? JS: What got me into music was the excitement of the Beatles and hearing Meet the Beatles and of course you want to be like that. But it was a bit of a fantasy world, the Beatles and the Rolling Stones and the Kinks and that sort of thing. They were people we saw on TV and on the screen and in photos and in magazines. They weren’t people you walked up and were able to touch. In that regard, there was a certain reality attached to our band and who we were. So I don’t know that I really had those kind of grandiose thoughts of hitting that. But at the end of the day, what I thought was possible, was creating music that turned me on as much as listening to those bands did and something I could be excited about and get some kind of emotional charge out of. I’d sit there in the studio and at the end of a John Fry mix there was this moment of revelation. If that was the goal, then that was hit. I was always excited about those mixes as John completed them. But it really was more about the music we were creating than it was about any delusions of grandeur. AD: How old were you when you started playing drums? JS: You know, I think it was probably 9th grade. So, 15 maybe? Oh, you know what. I started playing snare drum in 7th grade in the junior high school band. Maybe I did that for a year or so and then I got a drum kit in the 8th grade, so maybe 14. AD: The time period you grew up in was, in a weird way, when drums were really starting to come to prominence in popular music. You go back much earlier and the drums are really kind of buried under things, they don’t really propel the music in the way rock music is propelled by drums now. So what were you listening to that inspired you to start drums or even the style that you chose? JS: Well probably first and foremost was Ringo, being part of the Beatles. Stylistically he was always pretty intriguing, his performance and also the way he was recorded. But Keith Moon, B.J. Wilson from Procol Harum, John Bonham from Led Zeppelin, Al Jackson from Booker T. and the M.G.s. The British Invasion may have gotten me into music, but two or three years later came that wave of Stax artists. My brother and I had started playing together – he was a bass player – and as we continued to play, our band line up evolved out of a British Invasion band and then into a soul band doing Stax covers. So Al Jackson was certainly an influence. Drummers who had a particular feel or performance style that you could identify within just a few measures of listening. AD: What was it like growing up in Memphis with that music scene going on around you? JS: With the exception of dances – the Bar-Kays might play – Stax could’ve been thousands of miles away because, again, those weren’t artists I could see and touch. Stax was kind of like Mount Olympus or something where all these amazing artists recorded, but it really wasn’t somewhere I could go and hang out and touch and talk to the artists. Even after I started hanging out at Ardent, I’d see Staple Singers multi-tracks in the studio and during my duties as day guy at Ardent, I went over to Stax a couple of times but I never got inside. [laughs] That was as mythical to me as the Beatles in Liverpool. AD: What is Memphis like now compared to then? How has it evolved or not evolved over the years? JS: I think Memphis is still a pretty independent music scene. In that regard, people still have a way of defining their own direction and the way they go about it. I don’t think that much has changed. There might be even more people that express themselves as individuals rather than trying to reflect any sort of big current commercial success. AD: You’ve been working at Ardent Records for awhile. JS: Yeah, Chris and Andy and I would come in late at night and that started in 1970. As a matter of fact, on that Chris Bell record, the first song I ever recorded at Ardent was a song called “Looking Forward.” It starts the second CD of the Chris Bell reissue. It was definitely pre-Big Star. We continued to do things – what became known as the Rock City stuff – and then Big Star came together when Alex joined Chris, Andy and me. And we’ve been in this building – Ardent commercially started on National in 1966 and we moved into this building in 1971. We started Big Star’s #1 Record over at the other studio and finished it here and then recorded Radio City and the Third record and even In Space here. AD: Was there ever a temptation to record anywhere else? JS: Not for me. I’ve always been really comfortable here and secure in the thought that whatever we did here reflected the personality of the studio and whoever was sitting behind the console. I can’t speak for Alex or Jon [Auer] and Ken [Stringfellow], but I definitely have a preference for recording here. It’s not to say I haven’t recorded other places. I did some work with Matthew Sweet. I did some recording with Elliot Smith out in L.A. And Alex and I did some recording with Teenage Fanclub back in 1993 when we went over to do some press thing. We did a few covers with them – a special recording for the New Musical Express. But I definitely have a preference for here. AD: Who are some of the more interesting people who’ve come through Ardent to record over the years? JS: R.E.M. came through to do Green. They were doing the album prior to that in Nashville and I happened to be visiting. I called the studio and left a message for them and wound up getting together with Peter Buck and the other band members. Nice guys. Very down to earth. They were like old friends pretty quickly. The Afghan Whigs – Gentlemen was recorded here – I have a lot of respect for them. I didn’t really have anything to do with it, but Jimmie and Stevie Ray Vaughan did Family Style here and they were fun to have here. More recently, Jack White and Patrick Keeler brought the Raconteurs record here to mix. Jack also brought the White Stripes’ Get Behind Me Satan here to mix. Jack would be listening back to a mix and sing along and be excited. You’d think it was his first time in a studio, he was so pumped up and excited about it. Those kind of emotions are pretty contagious. AD: Our readers would feel me remiss not to ask about the Replacements’ Pleased to Meet Me and what you remember of that. JS: I started back at Ardent in January of 1987. The day I started back, Jim Dickinson and the Replacements were in Studio B recording Pleased to Meet Me. I had no idea who they were because I hadn’t really been active in music for awhile. I had gone back to school and gotten a business degree. I had called John Fry to ask him if it was okay to list him as a reference and he said, “you know, we might have a job for you here.” I was hired on the business side of things. It was my first day so I was re-baptized. It was pretty cool to have them. That record is in my top ten favorite albums. I’ve got to mention Star and Micey also. They’re one of Ardent Music’s bands – we have a label now called Ardent Music. One of the cool things about being a part of tha process and that band is that they’re fun guys to be around because they have this energy of getting things done and being excited about what they’re doing. They’re great songwriters and they’ve done this great self-titled record. They’re just off on a month-long tour that they booked themselves. They were packing their equipment and I noticed this crate of something and I asked what it was. They said it was their groceries. They have like 50 cans of tuna and 10 jars of peanut butter and you could see the loaves of bread. I get to work with people at all levels. I was just really taken with that, these guys, and their work ethic. It’s pretty cool to be a part of that. AD: You guys are getting ready to do a show to promote the box set. I heard about a deluxe edition of I am the Cosmos when they announced the box set, but I haven’t heard anything since. Why doesn’t Amazon or Cduniverse have it listed? The Chris Bell is a Rhino Handmade item, so I think you can only get it directly from Rhino. It’s expensive ($40). Great interview. The time between my classes tomorrow will be spent trying to get my hands on a copy of the boxset. Can’t wait to get my hands on it. I bought this box set last week and it has been just amazing to listen to. it paints the picture of the band clearly, making a bridge that marries 3rd with the first two albums , with loads of beautiful demo versions. especially of note are things like the demo of “Get What You Deserve” that makes it sound like a 3rd-era tune instead of the pulsey rocker it became. Boxed Sets are often dull and clumsy re-packagings of records that you already own if you are interested enogh to look into buying them, but this, in my opinion, is really something else. The Burritto Bros. cover and the Kinks tunes, the Big Star 3rd demos, the Chris Bell and Chilton acoustic renderings, this is all killer material. Been loving this box set, it is amazing!!! This band should have been HUGE. I definitely owe a debt to Paul Westerberg for turning me on to Big Star, otherwise I may never have heard of them.